The Japan Professional Photographers Society (JPS) was founded in 1950 by approximately 70 photographers aiming to affirm the rights and status of professionals in their field. The society began its activities with the objective of establishing and protecting copyright, promoting friendship and mutual assistance among members, furthering international photographic cultural exchange, creating new outlets for photo releases and facilitating job assistance. A major focus of our energies was a campaign to revise the copyright duration for photographs, bringing it in line with that for other creative works at 50 years after the death of the artist. This campaign successfully resulted in us winning those rights in 1997. The previous law guaranteed works for a period of only 10 years following the first public display or publication, and the copyright duration for existing works by photographers prior to 1956 has already expired. We are currently campaigning to extend that copyright date back to 1945. Since the founding of our society, we have, in addition to special exhibitions and exhibitions of works by members, hosted the JPS Exhibitions open to entries submitted by the general public and made efforts toward increasing the spread of and raising awareness about photography. In particular, through photographic exhibitions documenting the history of photography in Japan and publishing books about the history of photography, we have successfully heightened interest in this field. By encouraging the establishment of museums of photography, we have aimed to inform the public about photography, both as a historical record and as an art form. JPS presents the Japan Professional Photographers Society Award to groups and individuals who are recognized as having made outstanding contributions to developing technologies related to photography. Sad to say, many of the photographers who were active in the turbulent prewar and immediate postwar years are no longer with us, and the enormous number of photographic plates they left behind now face the danger of being discarded due to lack of proper storage space. JPS is engaged in a campaign aimed at setting up an appropriate archive — to be known as the Japan Photographic Preservation Center — to preserve these plates, which record the history of the period in which these photographers were active. To promote creative activities related to photography by fostering artists, hosting exhibitions related to history and expression, furthering copyright education, recognizing technological developments and expressive activities, publishing books and society journals and thereby contributing to the development of Japanese culture. 7. Other activities deemed necessary for the accomplishment of JPS objectives. We received a permit to operate as an incorporated body under the jurisdiction of MEXT. Since our establishment in 1950, JPS has promoted the creative activities of professional photographers, and worked to establish the photographers’ occupation and status on an ongoing basis. JPS collaborated with the Japan Photographic Copyright Organization to create a campaign aimed at amending the copyright laws. As a result, the copyright duration has been extended to 50 years after the death of the artist. Based on the previous copyright law (which guaranteed works for a period of 10 years following the first public display or publication), however, the copyright duration for a number of existing works by photographers has already expired. We are campaigning to retroactively restore those copyrights. JPS hosts symposiums related to the photography business, including copyrights, contracts and portrait rights, as well as lectures throughout Japan. JPS has published Photograph Copyrights (2003) related to copyright and portrait rights, and The Rules and Manners of Snapshot Photos (2007, Asahi Shinsho). JPS operates a Photo Learning Program for elementary school children at schools throughout Japan. We have also set up a series of Digital Photo Lectures for high school photo club advisers and conduct workshops on photography and technical guidance. JPS hosts Photo Forums, which discuss the social role of photographs for the general public and holds events aimed at promoting the further dissemination of the role and meaning of photographs. JPS hosts study groups related to newly developed products and digital technology, along with workshops. Through the JPS Exhibitions, which are held both in Kyoto and Tokyo, we make efforts to find promising new talent and exhibit and recognize these works in conjunction with the Ministry of Education, Culture, Sports, Science and Technology Award. In an effort to promote photography, JPS also hosts lectures and seminars for photograph enthusiasts at various exhibition sites. The JPS Catalogue of Exhibited Works is published annually. To find and promote budding photographers under 30 years of age, JPS accepts entries submitted on a general basis for this award. In addition to the award itself, winning works are exhibited. 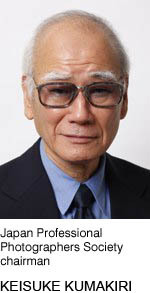 JPS recognizes those who have contributed to photography-related inventions, development and cultural development with its Japan Professional Photographers Society Award. JPS hosts photo exhibitions by its members along with special exhibitions. Notably, material from the following exhibitions — A Century of Japanese Photography (1968), Japan Modern Photography (1975) and Modern Japanese Photography: The Eye That Records and Creates (1995) — was published in book form by Heibonsha as Japanese Photography History 1840–1945 (1971), History of Japanese Contemporary Photography 1945–70 (1977) and History of Japanese Contemporary Photography 1945–95 (2000). These books have become standard works on the history of photography in Japan. JPS also hosted the Sixty Years of Japanese Children exhibition, and a photographic collection under the same name was published by Shinchosha. JPS sends representatives to international meetings and is also engaged in the recommendation of candidates participating in the Budding Artists Study Abroad System run by the Agency for Cultural Affairs. We also receive artists from overseas who are invited to visit Japan as trainees. JPS aims to deepen cultural exchange based on photography through the goodwill extended to overseas photographers visiting Japan. JPS publishes the Japan Professional Photographers Society Bulletin, established in 1956, published quarterly, and JPS News, established in 1969 and published 11 times a year. These present information on the society’s activities and members’ movements to both the photographic world and general public. We release information regarding the society’s activities through the JPS website http://www.jps.gr.jp/. JPS also publishes a List of Members on a biennial basis and History of the Japan Professional Photographers Society. JPS established the Committee to Promote Photography Museums and has succeeded in establishing numerous photograph museums. We are at present promoting a campaign to establish a Japan Photographic Preservation Center to engage in the collection, preservation and utilization of photo plates as a historic and cultural heritage. Japan Professional Photographers Society Exhibition, first through eighth held in Tokyo. This is Where You Live, a joint production held in Tokyo. History of Japanese Photographic Expression in the Past 100 Years, held in Tokyo, Nagoya, Osaka, Okayama and Niigata. History of Japanese Contemporary Photography 1945–70, held in Tokyo, Matsue, Niigata and Kure. JPS Exhibition, held annually in Tokyo, Kyoto, Nagoya, Hamamatsu, Niigata, and Fukuoka. Modern Japanese Photography: The Eye That Records and Creates, Tokyo, Osaka. The Heart of Japan — by 1,000 Photographers, Tokyo, Fukuoka, Osaka, Nagoya. Sixty Years of Japanese Children, held with the support of the Agency for Cultural Affairs in Tokyo, Nagoya, Kyoto and Yokohama. JPS has been active in compiling and exhibiting Japanese photography of the past. History of Japanese Photographic Expression in the Past 100 Years exhibition in 1969, History of Japanese Contemporary Photography 1945–70 exhibition in 1975 and Modern Japanese Photography: The Eye That Records and Creates exhibition in 1995 were all very highly rated. In addition, three books on the history of Japanese photography have been published by Heibonsha under the editing supervision of JPS. The first was Japanese Photography History 1840–1945, published in 1971. 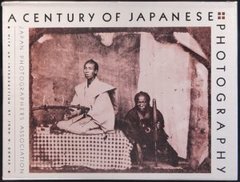 This book was later translated into English and published as A Century of Japanese Photography by Pantheon in New York in 1980. In 1977, History of Japanese Contemporary Photography 1945–70 was published. In the spring of 2000, History of Japanese Contemporary Photography 1945–95 appeared in the bookstores. From 1979, key members of JPS and others from the photographic community started to lobby for the establishment of photography museums and public collections in Japan. Their efforts bore fruit by the mid-1990s with the establishment of photography departments at public museums, such as the Kawasaki City Museum, Yokohama Museum of Art and Tokyo National Museum of Modern Art. The Tokyo Metropolitan Museum of Photography, Japan’s first public museum dedicated to photography, was also built. Our contact information is as follows. Note that we do not accept inquiries from individuals. Please contact us through your photographers organization instead. Japan Professional Photographers Society JCII Bldg.